To see maps, ratings, photos, and other tourist information, use the Kodagu (Coorg) journey maker website . Mumbai to Kodagu (Coorg) is an approximately 5.5-hour combination of flight and taxi. You can also drive; or do a combination of train and taxi. Wrap up your sightseeing on the 9th (Fri) to allow time to drive to Mysore District. Mysore District is an administrative district located in the southern part of the state of Karnataka, India. Start off your visit on the 10th (Sat): take in the spiritual surroundings of Sri Chamundeshwari Temple, learn about wildlife with up-close encounters at Sri Chamarajendra Zoological Gardens, and then explore the historical opulence of Mysore Palace (Amba Vilas). To find ratings, traveler tips, maps, and tourist information, refer to the Mysore District road trip planning website . You can drive from Kodagu (Coorg) to Mysore District in 2 hours. Alternatively, you can do a combination of bus and taxi. In August in Mysore District, expect temperatures between 30°C during the day and 23°C at night. Finish your sightseeing early on the 10th (Sat) so you can drive to Ooty (Udhagamandalam). On the 11th (Sun), take your sightseeing to a higher altitude at Doddabetta Peak and then take in nature's colorful creations at Botanical Gardens. To find photos, reviews, maps, and more tourist information, go to the Ooty (Udhagamandalam) online tour itinerary planner . Drive from Mysore District to Ooty (Udhagamandalam) in 2 hours. Alternatively, you can do a combination of taxi and bus; or do a combination of taxi and bus. Expect somewhat warmer weather when traveling from Mysore District in August: highs in Ooty (Udhagamandalam) hover around 37°C, while lows dip to 26°C. Wrap up your sightseeing on the 11th (Sun) early enough to travel to Kovalam. Kick off your visit on the 12th (Mon): kick back and relax at Kovalam Beach, admire the landmark architecture of Sree Padmanabhaswamy Temple, take in the spiritual surroundings of Sreekandeswaram Mahadeva Temple, then see the interesting displays at Puthenmalika (Kuthiramalika) Palace, and finally make a trip to Pazhavangadi Ganapathy Temple. To see maps, traveler tips, reviews, and other tourist information, use the Kovalam road trip planner. Do a combination of taxi and flight from Ooty (Udhagamandalam) to Kovalam in 4 hours. Alternatively, you can do a combination of taxi, bus, and flight; or drive. Expect a daytime high around 36°C in August, and nighttime lows around 28°C. Finish your sightseeing early on the 12th (Mon) so you can travel to Thekkady. Start off your visit on the 13th (Tue): see the sky in a new way at Green land spice garden, take some stellar pictures from Chellarkovil Viewpoint, then explore the activities along Periyar Lake, and finally identify plant and animal life at Periyar Tiger Reserve. To see more things to do, other places to visit, maps, and other tourist information, go to the Thekkady day trip planner . You can do a combination of flight and taxi from Kovalam to Thekkady in 3.5 hours. Other options are to drive; or take a bus. Finish up your sightseeing early on the 13th (Tue) so you can go by car to Kochi (Cochin). 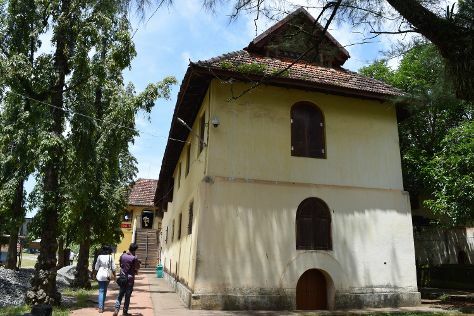 Start off your visit on the 14th (Wed): take in the spiritual surroundings of Paradesi Synagogue, admire the landmark architecture of Mattancherry Palace, admire the landmark architecture of Santa Cruz Cathedral Basilica, then explore and take pictures at Kerala Kathakali Centre, then don't miss a visit to Chinese Fishing Nets, and finally take in the spiritual surroundings of Church of Saint Francis. For photos, ratings, traveler tips, and more tourist information, read Kochi (Cochin) online driving holiday planner . Traveling by car from Thekkady to Kochi (Cochin) takes 2.5 hours. Alternatively, you can take a bus. In August, daytime highs in Kochi (Cochin) are 36°C, while nighttime lows are 28°C. Wrap up your sightseeing on the 14th (Wed) early enough to travel back home.